Pursuing his investigations of high financial fraud, international banking, hidden systems of finance, black budgets and breakaway civilizations, author and researcher Joseph P. Farrell continues his examination of the post-war Nazi International, an “extra-territorial state” without borders or capitals, a network of terrorists, drug runners, and people in the very heights of financial power willing to commit financial fraud in amounts totaling trillions of dollars. Breakaway civilizations, black budgets, secret technology, occult rituals, international terrorism, giant corporate cartels, patent law and the hijacking of nature: it’s all in this book where Farrell explores what he calls ‘the business model’ of the post-war Axis elite. It is Farrell at his best—uncovering the gargantuan financial fraud and hidden technology of the breakaway civilization. 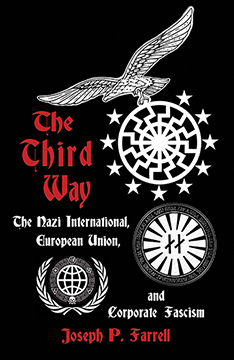 THE THIRD WAY The Nazi International, European Union, and Corporate Fascism By Joseph P. Farrell. 376 Pages. 6x9 Paperback. Illustrated.Bibliography.